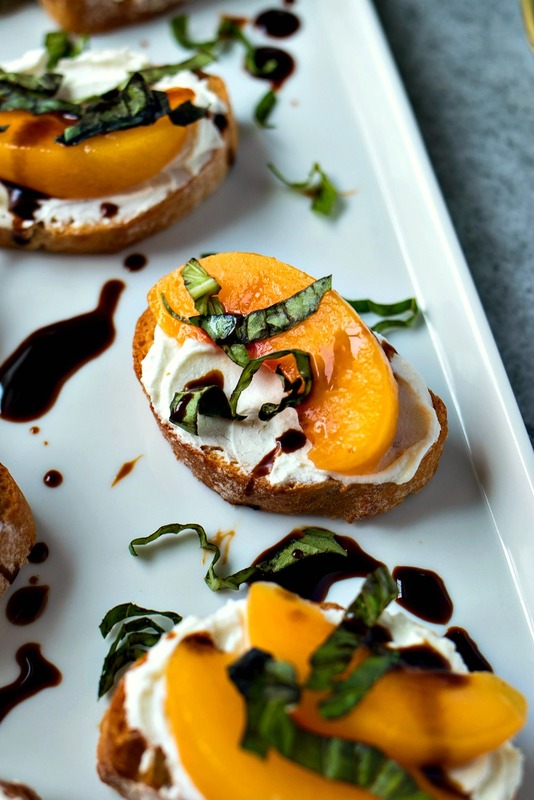 Peach & Goat Cheese Crostini – Slices of crusty, toasted baguette are rubbed with garlic, topped with whipped goat cheese and sliced peaches, and finished with basil and a drizzle of balsamic glaze. Perfectly paired with Notable Wines Fruity & Crisp Chardonnay. Are you ready for another installment in my wine pairing series?? You guys have been loving the wine pairing posts this year so I happy to bring you yet another great way to pair your favorite wines with some incredible food. But before we get to today’s recipe, do you remember all the wines we’ve covered so far?? Which one has been your favorite so far??? If you loved the Notable: Oaky and Buttery Chardonnay that I posted in spring, you’re gonna love today’s wine too! Today we’re pairing with Notable Wines other chardonnay – Notable: Fruity & Crisp Chardonnay. As you may remember in my previous post on Notable: Oaky and Buttery Chardonnay, Notable Wines are the first wines to highlight the flavor profiles right on the bottle, making the pairing process super easy for you. As you can see in the bottle above, the Notable: Fruity & Crisp Chardonnay pairs the best with citrus, melon, and peach flavors. So that helps us narrow down the types of foods to pair with this wine. To get you prepped for all your holiday parties coming up, I decided to make this pairing an incredible appetizer that has yummy peach. Check out my Peach & Goat Cheese Crostini! Earlier this year, I shared my Tomato & Whipped Feta Crostini. In that post, I explained what crostini were, but I never explained what makes crostini different from bruschetta. The truth is that the difference is extremely subtle so you’ll often see the terms used interchangeably. But if you ask me, I think of bruschetta as large pieces of breads with hearty toppings, whereas crostini are little pieces of bread with dainty toppings. I guess you could say bruschetta is rustic and crostini is fancy. At the end of the day, though, they both feature crusty bread and that’s all I really need to know. To make this recipe, it’s very similar to the tomato & whipped feta crostini, but fewer ingredients, and, thus, fewer steps. All you need for this recipe is a baguette, peaches, a garlic clove, goat cheese, cream cheese, basil, olive oil, and balsamic glaze. One of the surprising flavors of this crostini is the subtle garlic flavor. Instead of chopped up garlic into the goat cheese like I did in this whipped goat cheese recipe, we’re simply rubbing garlic onto each toast. The warm temperature of the toasted bread absorbs the garlic oils and adds the perfect touch to each crostini. Guys, don’t underestimate the power of a little garlic essence. Let me just say this about these crostini…good luck trying to have just one! I was munching on these all through this photo shoot. But is that really shocking? Goat cheese makes everything incredible. If peaches aren’t super flavorful, toss in a tablespoon of sugar before using them. This goes for fresh or frozen peaches. And speaking of frozen, don’t shy away from using frozen peaches if you don’t have fresh peaches available to you. I’ve used them before and they make for a pretty great substitute when you don’t have the fresh stuff around. Use store-bought balsamic glaze instead of making it yourself to save time. I found some in the vinegar aisle at my local grocery store. I keep a bottle of it in my pantry so I can drizzle on a salad or chicken or anything. This stuff is gold, people! Don’t not assemble the crostini until you plan to serve them. They do not keep well when stored because the bread can get soggy. If you want to prep ahead, you can make the whipped goat cheese ahead of time and store in the fridge until assembly time. You can also slice the peaches and bread ahead of time to save time. There you have it – the best appetizer for all you parties this season and the best wine to serve alongside it. Make sure to check out Notable Wine’s website to see where you can find their wines near you! Slices of crusty, toasted baguette are rubbed with garlic, topped with whipped goat cheese and sliced peaches, and finished with basil and a drizzle of balsamic glaze. Perfectly paired with Notable Wines Fruity & Crisp Chardonnay. Preheat oven to 375 degrees. Slice baguette into 1/2 inch slices and arrange onto large baking sheet. Brush olive oil onto each piece of bread. Bake in preheated oven for 6-8 minutes, or until the edges get golden brown. Set aside to cool. Slice log of goat cheese (skip if using crumbles) and place into food processor with whipped cream cheese, and a pinch of salt and pepper. Pulse until mixture whips up and comes together. Cut garlic clove in half and rub onto toasted bread slices. Spread each slice with a teaspoon of whipped goat cheese. Add one or two thin slices of peach (or a teaspoon of diced peaches) to each crostini. This looks amazing! Love sweet things with goat cheese. This looks so good! Need to make this asap! YES!! These look fantastic and perfect for hosting. I will have to try to make this very soon. It seems so simple. These look great! It’s such a great appetizer idea for the holidays! It looks so delicious! It never crossed my mind to pair peaches with goats cheese and eat it as a sandwich. I have to try it! Sounds like the perfect pairing! I love your recipes! This recipe looks so amazing! I will try this!